Extend the Season – Heating your outdoor room with an outdoor heater will extend your outdoor entertaining season and allow you to enjoy your patio or other outdoor living space for a couple of extra months or in some cases year round. Smokeless Burn – Liquid propane provides a smokeless burn and plenty of heat to keep you and all of your guests warm on those mild autumn nights. Bring the Heat â and Warmth â To your outdoor conversation space with the Fire Table. Contemporary Appeal – Offering both useful functionality and contemporary appeal, the stylish patio heater features durable construction finish. The attractive color finish effortlessly complements most patio furniture collections and surrounding outdoor decor. 40,000 BTUs of Heat – The heavy-duty firepit heater offers an impressive heat output of 40,000 BTUs. Mid-winter merry-making? No problem. the firepit heater delivers quiet, soothing, consistent heat–with no smoke. Access Door – An easy access door located at the base to switch out propane. Fire Glass – Fire glass covers the burner and adds a touch of elegance. 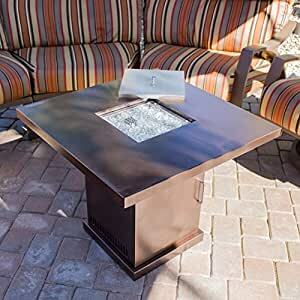 Safety feature – Added safety, this fire pit comes with a thermocouple flame failure device. CSA / ANSI Certified. Size of Burner : 11-1/4″(W) x 11-1/4″(L). Overall Size : 30″(W) x 30″(L) x 25″(H). RECEIVE FREEE BONUS E-BOOK. for outdoor entertaining and uses a standard propane tank (not included).